Whether you like it or not, the Rangers need to explore all possible trade scenarios. That includes that of Chris Kreider, who may bring in the most in trade value. 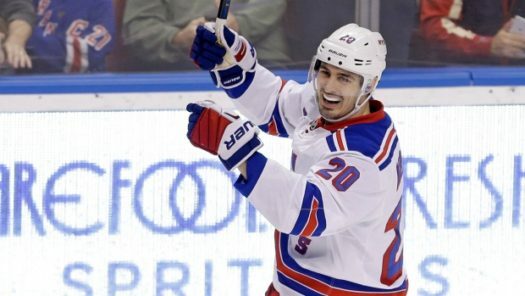 If the Rangers trade both Kreider and Kevin Hayes, we could be looking at another significant step forward in the rebuild. First things first, the Rangers do not need to trade Kreider. He has another year on his very affordable contract left ($4.625 million). He’s a bonafide top line player with a very rare skill set. He’s one of the fastest skaters in the league, he’s freakishly strong, he has a decent shot, and he’s excellent in front of the net with screens and deflections. The Rangers need players that are top-six capable to fill in the gaps with their elite level prospects. Otherwise they wind up in the Edmonton situation. But if the Rangers were to trade Kreider, it is fair to expect a haul. What would 2015 Keith Yandle (mid-to-late-20s, 50% salary retained, 100 games + 2 playoff runs) fetch in 2019? Because that's probably a good benchmark for what Kreider (50% retained) would fetch. HSM starts things off with a good comparable. At the time of the Keith Yandle trade, Anthony Duclair was a top-50 prospect and a top-two prospect in the organization. So the return for a year and a half of Yandle at 50% retained was a top prospect, a young-ish third pairing defenseman, a first rounder, and a second rounder. Yandle, however, is not a commodity that all GMs seek. Whether you agree or not, he had a reputation of “offense only” and “a defensive liability.” Even if that wasn’t true, it can impact trade value. Kreider doesn’t come with that baggage/reputation. Ryan McDonagh may be a closer comparable here. Excluding the Miller/Namestnikov swap, the Rangers landed Brett Howden, Libor Hajek, a 1st, and a conditional 1st (2nd if TBL doesn’t win the Cup). That’s two solid prospects (probably both top-100, but I can’t find any old rankings), a guaranteed first rounder, and at least a second rounder. McDonagh, like Kreider, didn’t come with baggage or a potential hole in his game. He was an established top pairing defender, in the way Kreider is an established top line forward who is well on his way to a 30-goal season (he would have had 30 in 2016-2017, but finished with 28 goals in 75 GP, a 30-goal pace/average). A team acquiring Kreider is going to need to give up a lot to land him. A top line player who can put up 30 goals at $2.3 million (50% retained) is a major asset to any competing team. All that said, the Rangers do not need to trade Kreider. It’s the exact opposite situation with McDonagh, where the Rangers really did need to trade him to go all-in on the rebuild. With Kreider, you have a guy that can be that next clubhouse leader. I know intangible are hard to quantify, but the fact he speaks Russian is going to come up a lot. Vitali Kravtsov and Igor Shestyorkin are on their way to New York sooner rather than later. Pavel Buchnevich is here already. Making these kids comfortable is an important aspect to growth. At this current juncture, there is no wrong answer with what to do with Kreider. It is always better to trade a player a year too early (like the Blueshirts did with Derick Brassard) than a year too late (like with Dan Girardi – which led to a costly buyout). These are the difficult decisions that do not make me jealous of Jeff Gorton’s job. However if he’s given an offer he can’t refuse, then there shouldn’t be anything holding him back from pulling the trigger. "Looking into Chris Kreider's trade value", 3 out of 5 based on 12 ratings. Unless you can move Krieder for a guaranteed top 3 pick, I do not make the deal. We require elite talent, but we also require very good talent. Krieder and Zibanejad qualify as very good top 6 talent. His cost is fair and his output is good. We have plenty of middle 6 guys we can package up for assets. I mean SOMEONE like has to score next year , no? Lets say its a mcdonagh sum of the parts return that no offense to howden many think was underwhelming … Just wait til next year with kreider to decide. I don’t think the deal on the table will be THAT much worse. Also I think it’ll be dumb to not at least see how he looks with Vk. I look at our situation this year as different than last year — last year was about restocking the cupboard, this year it’s about adding the right pieces to the cupboard, it’s about completing the sets so to speak. Best to go for less assets, but higher quality. I can’t see LVGK wanting or needing him. They love Tuch as a depth power forward and Kreids isn’t pushing anyone like Smith or Marchessault down the lineup. I think that team would go for some form of defensive help on the blue line. I don’t know if these team’s are packing it in yet but Edmonton, Dallas and Anaheim would be places that would want him. San Jose, Boston and Winnipeg would be the contenders that might call in on him. Except I was watching the vegas telecast of our game recently and lawless was raving about him as a trade target during the first intermission. hey Gary , glass/brannstrom or take a hike. Lol that pen*s head is your backup line? Right on.. But try watching the LVGK if you want to play armchair GM. That team is built on chemistry and as I said before, Kreider isn’t pushing anyone like Smith and Marchessault down the lineup. Their bottom 6 is pretty stacked with toughness and they already have a power forward in Alex Tuch. Carrier and Reaves put in more work on the forecheck in one game than Kreider did in one month. It’s not going to happen dude, they don’t need him. I’m still waiting ro see what rebuild everyone is talking about! Retool is a better word for what has been done so far. One thing with Kreider is speed , you can’t teach that. You can build strength and add a little weight or take some weight away but the speed doesn’t work the same way. You’re going to need a good haul. They may get it. He would fit very well in Colorado and Vegas. And plenty of other places to I am sure. But they both have a lot of assets to offer that we would want. That said I would not offer to retain half his salary. We can only retain salary for 2 more players. I think there would be much better retention value to offer Shattenkirk at half retained salary. Kreider’s cap hit is very reasonable and you can take a piece back in a salary dump with the trading partner if necessary. If you can find a taker for Shatty with 3 play off runs left at half salary, that would boost his value more than Kreider in my opinion. If we think we can move Smith, even as part of a bigger deal, we may need to retain half his salary just to make that deal happen. And if they get to the point where they are gong to trade Hank, retaining half his salary would add a lot more value. We need to use those retention’s wisely. Retaining any of Spooner’s Salary was a small but bad move. I will take Colorado’s first rounder from the Senators this year. Plus second rounder. I’d cry if they did this. I guess it really comes down to his next contract. Do we want to give him 7 mil a year or so for a guy that will be exiting his prime? He’s got a partial no trade now, he’s gonna probably demand a full one. I’m on board with getting a great haul now, IF we can get it, and I think we can. I am leaning this way as well. This is getting to sound like a broken record. I still counsel against trading either Kreider or Hayes … and Mika for that matter — but sure, if someone is willing to blow me away then anything is possible. The teams that fail to rebuild are the teams that have nothing to build around. There needs to be a “center” of sorts, an anchor or established core group of players that can carry the load and set a good example. Quality over quantity if dealing early. I think Edmonton has shown the folly of trying to rebuild, (or retool, whatever you want to call it) with only young players. Four number 1 picks in recent drafts, and one playoff series. Not a good record. There has to be a core in place, maybe not elite players, but good solid players who provide the environment for the kids to develop. Kreider is the epitome of that kind of guy. there are plenty of players to fill that roll it does not need to be Kreider. Who has a rep of evaporating before your eyes and showing up a week later! Deal him if the haul is there! He’s going to get at least 35 goals and is easily the top finisher and power forward on this team. Unless someone is willing to pay a legit top prospect that’s a can’t miss, I’m not trading Kreider. He is a team leader and the next captain. I feel similarly about Hayes except he can leave. So, it’s more probable he will be moved for a late first round pick and prospect. Chytil could take his place. Pretty sure that Colorado owns Ottawa’s 1st rounder this year from the Duchene trade. Maybe Colorado would make the deal to get Kreider and make a cup run, but I don’t know if anyone would give up the shot at Hughes or Kakko who are both pretty much locks to be as good as Kreider and most likely better. Yo Tanto, they would keep Hayes after a Kreids trade. You would have to figure that someone like Vlad and Smith are off this team no later than the next off-season. That’s a hefty amount of $$ that would be piling up. Remember what JG said in the introduction of Quinn as the next head coach? He’ll get to be in all the major roster moves and have a big say in those discussions. Imo he would rather have Hayes on his team than Kreider. IMO he would rather have BOTH. Unless you can move players for guaranteed top picks, I am not sure you ever trade your best young players due to potential contractual issues. Hayes and Zucc are real contract issues, Krieder and Zinbad are still playing under fair contracts. We have Cap space to make some of our problems go away (like Brendan Smith), but Krieder is not a problem. Well said Sal – that really says it all. No longer a rebuild – it’s a build, unless one wants to keep “rebuilding” and end up like Edmonton. Krieder, Zib and even Hayes are keepers – lets trade only if we get overwhelmed by an offer, not for the sake of trading. ? What is a sizable haul for Krieder? Acquire 2020 first rounders. please. Kreider, Zuc, and a late #1 for the Avs’ pick from Ottawa. If San Jose wanted to continue to screw up their team chemistry for Jumbo Joe than…. Kreider and a 3rd for Timo Meier and Donskoi. I guess no one likes my proposal, which is fine, except that’s where the franchise player will come from. I think that is way too much for that pick. The rangers are not that far off from being the number 1 seed in this coming draft. We are 5 points away from last place. Looks like number 1 draft selection to me. As I said Hayes or Krieder gets that pick plus a bonafide prospect or walk away from the deal. There are better deals out there and Avs are a hard bargaining team so no way I see it happening. If hayes or Krieder are traded I see a real prospect return….. someone who is dominating at the AHL level. Or is having a good first season at the NHL level. We have enough picks at this point. Or could just be a swap of players like a Larsson for a Krieder or Hayes. I would trade both Hayes and Krieder and even add Zuc for Aho. we won again last night, so they went in the wrong direction. Again. I would agree with giving Kreider, Zuc, and Tampa’s pick for that. If the Rangers play like they Choose2Lose4Hughes, you might end up with Hughes AND Kakko or Krebs. I concur, but something tells me COL would be asking for our first rounder. TB is looking pretty good right now, but that pick is still more likely to turn into a second rounder than not. A very good friend of mine said that if Gorton plays this right, he could have 3 of the top 6 picks in the draft. That sounds unrealistic, but I have also heard that all the playoff teams know the Rangers are open for business and they have very useful players that can help their playoff runs. … and a late #1? You’re overpaying. I truly think the front office feels that the prospect pool is stocked. So if we trade anyone it is going to be for a player for today and maybe a prospect/draft pick….late round. I don’t see them moving anyone at this point. I was strong of Zuc being moved and his resurgence tells me that the front office talked to him and he is going to get resigned. I have a feeling the offers that were out there for him just were not that good and he was/is willing to take a team friendly cap contract. He is a great player and we really don’t have many wingers left. Krieder….I just don’t see anyone out there really offering anything. Draft picks are certainly out there but I don’t think Gorton wants anymore draft picks. I think the front office wants real today ready players and no one is going to make that trade unless they feel it is a steal or it’s a locker room cancer thing. And most of the trouble teams have made their moves. Like do we want Brassard back for what? I mean the Ducks could move what? All the talent on that team is injured and they all have m nmc’s …so I just don’t see a deal. I am sure there is a trade out there to be had …I just don’t see us as the team that gets it. The teams in contention we just don’t have a good trade history with or any for that matter. I don’t see it. In my opinion, players who may be third line/second pair at peak powers are not what the Rangers need more of at this junction. Gorton has certainly not completely tanked in his deals since The Letter (except McQuaid; totally unforgivable boneheaded move there), but he hasn’t exactly knocked it out of the park, either. Howden, Hajek, Lindgren, Rykov…these are not scrubs or project prospects by any means; decent assets…but they also aren’t truly A level assets. Late first/early second round picks aren’t truly A level assets, either. I believe those players were all more or less expendable parts for those organizations, in the respective positions those teams were/are in. I know it’s easier said than done, but good GMs convince their peers to cough up assets that weren’t considered expendable before the phone rang, and I honestly just don’t think Gorton pulled that off yet going all the way back to the Stepan trade. A great move will leave the other guy wondering if he just made a big mistake or not…we kinda really need Gorton to pull that off once or more during this process. Regarding Richter’s comment above, I kinda cringe at thinking of giving up two of the faces of this Rangers generation/era, and a first (especially if ours) as well…but, on the other hand, that’s probably the type of risk Gorton needs to take if he really wants a blue chip asset at this stage. Even that Ottawa pick is no guarantee to be treated kindly by the lottery, of course. It’d be great if another GM did us a Chiarelli-caliber boneheaded favor for a true blue chip prospect that is near development’s end, but that obviously can’t be banked on. Shy of that, Gorton may have to take some real big risks this deadline and summer if he really wants to shift this rebuild into the next gear. That’s just the price he has to pay now for not dismantling the roster enough last year to truly tank this year. Gorton has kinda been Mr. Half Measure, so far, for this thing. This is spot on. Trading McD and Miller and getting back middle 6, bottom 4 talent along with late R1 picks is not a great return. Now he has the next and final go round with Hayes, Zucc and possibly Kreider. The prospect pool still needs top line / top pair esp on the wing. Kreider is a top 10 LW and needs to bring back a top line prospect. Hard Cap makes asset management much harder for GM. It’s the back line which will send this season to top 5 pick but frontline scoring could be available thru free agency. If I’m the GM, I don’t want any 50 man roster players so I can manage the expansion draft with full flexibility. Only teams where you can get anything close to what you give up is Colorado, Carolina & Vegas. Colorado I’d be asking for Ottawa’s pick or their 2019 & 2020 1st rounders to start, don’t think they’d get it. Carolina would be the same starting point. Vegas I’d want both Glass and Brannstrom(a D I’d make an exception for) and a 2nd rd pick they got from somebody else. Anybody else that wants him, you’d be getting five dimes for a dollar. I’m in the camp that if a super offer is made, well they traded Gretzky didn’t they!!!!!! Having said that, I am a fan of Chris, and his current contract is very reasonable, so I’d trade him, if need be, next year at a crack at the top picks. The guy is a proven commodity, is good on the PP, speed to burn, strong as a bull, what more can I ask for? If the Av’s offer their #1 from the Sens, all bets are off. I could live with a Hughes, and or Kakko in lieu of Kreider. I’d move Hayes in a heart beat for any #1 out there along with prospects!!!!!!! Pssst. Trade King 4 or more. And I don’t care if it’s an unpopular idea. You can try to talk him into giving up his NTC if that’s what you want. 1. NMC. He’s only getting traded if and when he decides he wants to be. That may not be convenient for the team right now, but unlike lots of players with NMCs, Hank actually more than earned his. We can question his philosophy all we like about possibly winning a Cup elsewhere or staying in NY and not doing do – that’s fully his prerogative, so it doesn’t matter how we feel. 2. Front office thinking. They may value Hank’s continued presence quite heavily, for various reasons. If they fancy themselves contending next year or the year after (whether or not it is realistic to fans does not mean they see it the same way), they may not be comfortable rolling with Georgiev and ________ (we assume Shesty or Lindblom, but you never know). There is a certain value in an elite goalie “handing off the torch” to the next guy, being there to mentor them along the way. There also could be a loyalty and/or favoritism factor in play – we know that sometimes Sather, at the very least, makes decisions with his heart rather than his head. Gorton may be the same way – probably not a coincidence that he was a big part of the Bruins front office when McQuaid was scouted and drafted, and I can’t help but to think that brand of favoritism led to him clearly overvaluing McQuaid in the trade market last summer. All in all, the front office may not even be nearly as interested in trading Hank as we fans may assume. 3. Demand. If Hank were to waive his NMC, and then the team is all for trading him as well, the next thing that needs to be considered is the needs of other teams. How many contenders out there see Hank vs. their current goalies as the move that puts them over the top? For all we know, that level of demand is slim to none. I could be mistaken, but it doesn’t seem to me that a lot of goalies get moved in deadline deals in general, if I am recalling correctly. There is a notion in certain circles that a true Cup caliber team can do it even with a mediocre goalie. 4. Money. Hank isn’t the highest paid player in the league, but he also isn’t cheap. So, among that pool of teams who see themselves precisely one 37 year old (by the playoffs) Hank away from a Cup, how many could actually afford him under their cap, regardless of what the Rangers retain? For all we know, that number is zero even if #3 isn’t. 5. Return. Goalie trades have produced low returns for the team trading them away in a lot of cases in recent years. If the Rangers have to look at retaining half of Hank’s salary just to move him for a paltry return, they may not really find it all that worth it. What are they gonna get for half of Hank’s salary next year…a middle six assist specialist type or 2nd pair type defenseman? Not that there is no place for those types of players in a rebuild, but overall, it seems to me that really wouldn’t move the needle all that much. Lots of moving parts, but the rest don’t even matter without #1 being out of the way first. We need elite players. If Krieder can get us an elite player, go for it, otherwise I think we are doomed to mediocrity We need a 4 for 1 deal and that one has to be a superstar. Who is it? I do not know, but it ain’t Chris Krieder.